If you long to quilt your own quilt tops but are lacking in confidence or unsure how to get started in free motion quilting, this class may be just the ticket! 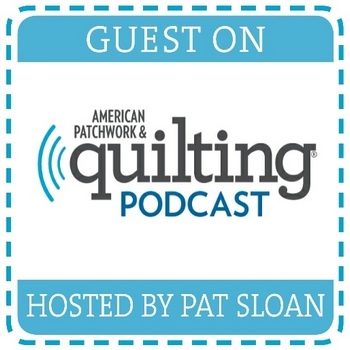 We will cover the basics of free motion machine quilting including needle and thread selection, basting, batting, and machine tension. 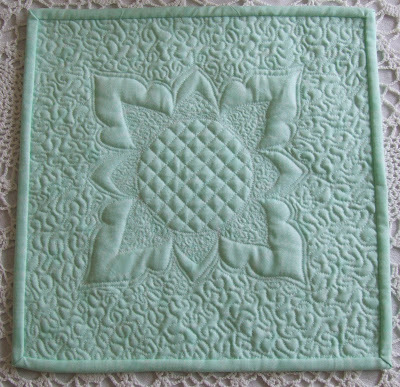 Sample squares will be stitched with various techniques including stippling and meandering, following a marked line, echo quilting, and background fillers. We will then apply what we have learned to mark, baste, and free motion quilt the miniature whole cloth pictured in green above (fabric provided in kit). Many quilts will be shown for inspiration. 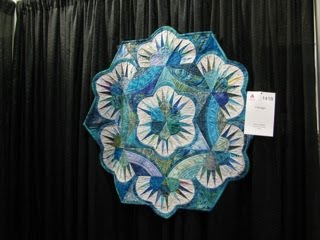 There is no pre-requisite for this beginner free-motion class, however you need to be comfortable with your sewing machine; this is beginner free-motion, not beginner quilting.The same class will be offered twice during the 2011 Nova Scotia Fibre Arts Festival in Amherst, Nova Scotia. 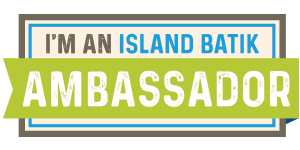 Where: Trinity St. Stephen’s United Church, 1 Ratchford Street, Amherst, N.S. Cost: $60 + $5.00 kit fee, which includes fabric for your sampler. Email to register. At that time, a list of what to bring to class will be provided. N.S. Quilters Meet The Challenge! "Well, Honeycomb, be my own ..."
Despite the cold rainy start to the season, the bees are doing magnificently. The field right in front of their current location is yellow with dandelions, as are the pollen pouches on their hairy little bee legs most days. The hives are strong and healthy, with lots of brood. Can you spot the queen working? Sometimes she is easy to see, other times it's like playing Where's Waldo in reverse, where everyone is wearing a striped shirt except her. In an earlier post, I showed a large piece of burr comb we discovered in one of the hives when we opened it for the season. When we removed the inner cover of this hive last time, the unsupported comb broke off. Looking to see why it was so heavy, we found the comb full of brood. Naturally, we did not want to lose all these soon-to-bees (!) This is a beautiful brood pattern; nearly every chamber is being utilized - the work of a very good queen. Clever Hubby devised a scheme to fit the slab of honeycomb into a wooden frame to give it more support. He gently lifted the wobbly comb from the hive and laid it flat. Using sharp hive tools, he carefully sliced along the edges to square it up and fitted it into the frame. You can see from his bare hands that the bees were not a bit bothered. Perhaps they sensed he was was working to save their babies. He was able to place the frame successfully back into the hive. This weekend, the first of the hives will be moved to blueberry blossoms. It's a big job. Thankfully, the local Tim Horton's opens early! Does it make a sound? That's the question my entry in this year's CQA Trend Tex Challenge poses. 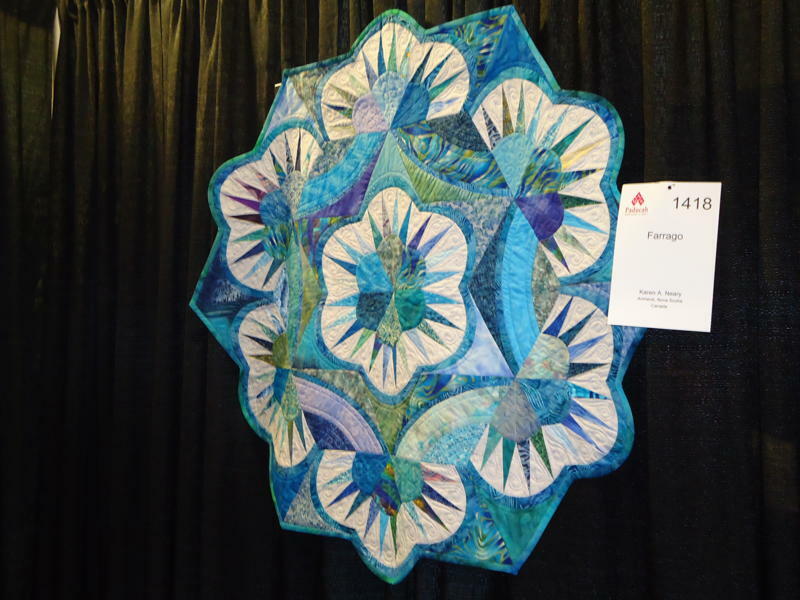 This annual challenge is a fund-raiser for The Canadian Quilter’s Association (of which I am a member) with all quilts going up for auction. It is held during Quilt Canada which this year is in London Ontario, May 24 - 28. Each participant purchases the same 5 Fat Quarters of fabric for their challenge quilt. You can see the fabrics in an earlier post. This year's theme is Quilting In The Forest, so I began with 4 Tree of Life blocks for my forest. I drew a sketch of the block and coloured it in by hand to get the colour placement correct. The idea was to rearrange some of the half-square triangles forming the foliage into recognizable mini quilts. I also added triangles to the base of the tree trunks to form a secondary quilt design where the blocks meet in the centre. You will notice one tree has a blank spot (the black background fabric shows) from where a quilt has just detached and is gently wafting to the ground. This is the separate mini log cabin which will fit in that spot. It finishes to 2-1/2", so the blocks are 1-1/4" each. The logs are pretty narrow. I added a plain border in the background print, and drafted a template from card stock to trace a scalloped edge. It's a very high tech process. Using a white Clover marker, I traced the scallop outline on the quilt. Because sometimes the marks will rub off during handling, I like to stitch along the marked line with a contrasting thread. I trapuntoed the four quilt sections in the trees. The next step was the dreaded basting...a necessary evil in the quilting process. While basting, I was thinking ahead to how I would quilt the piece. There really wasn't much room and the border was quite narrow, so I doodled out a feather border on paper to see how it would look. It isn't very wide, but I decided if I kept the feathers tightly spaced it might have a bit more impact. It was a tight fit. Because I used black thread on the black print, the quilting did not show up very well in the picture. The extra layer of batting helped the little quilt blocks stand out. When the quilting was complete, I trimmed the quilt along the stitched scalloped border and had just enough of the yellow Fairy Frost to make the bias binding. I was hoping to use the red which forms the tree trunks but there simply was not enough left. The little log cabin was added with hand stitches, as were some stitching details. It was a fun piece to make, and it's always interesting to see the different results folks achieve for these challenges. 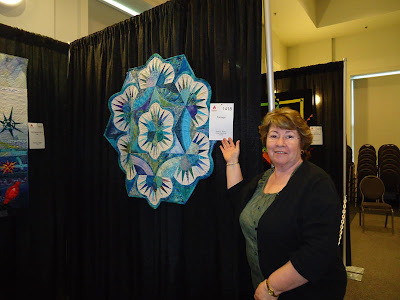 You can see the rest of this year's entries here on the Canadian Quilter's Association website. Here's one I hadn't previously considered: the holes in the Swiss eyelet are the perfect size to catch the little toe of my Bernina #24 foot. That took some care to avoid. Despite that, the double heart border is all quilted. Now to find some matching fabric for the binding. Nice to have another finish! Once the dreaded basting was done on the stork quilt, the actual quilting went very quickly. The rationale in choosing what to quilt was to make it secure enough to launder well but to leave enough"pouf" for softness. All that's left now is the outer border and binding, which is one of my favourite parts. Hopefully there is a bit of that yellow to be found but I'm not holding out much hope. It may end up blue, like the centre. I used Konfetti thread, which is a 50 weight cotton by Wonderfil. Konfetti has become my dependable "go to" thread, and always works well in both piecing and quilting. I've ordered in a bunch to have available during the N.S. Fibre Arts Festival workshops in October. The rain has actually stopped, but it's still too wet outside to do any gardening. The lawn is desperately needing to be cut but the grass has to dry off a bit. In the meantime, I have finished another sample for my workshops for Fibre Arts Festival and worked out the class description and supply list. It will be posted to the website shortly. Unlike the song, these make for good quilting days. I am taking advantage of the indoor weather to stitch up some samples for an upcoming workshop. During the N.S. 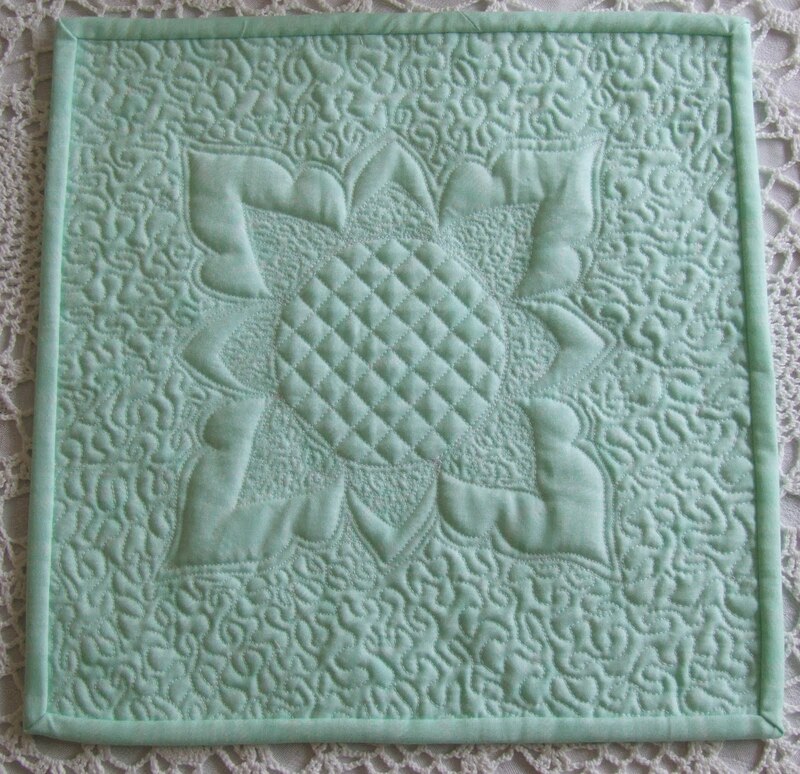 Fibre Arts Festival in October, I will be doing classes on beginner free motion quilting and the class project will be a small wholecloth sampler of stitches. Details will be posted on my website shortly. While in my dreams I am with the rest of my profession at Spring Quilt Market in Salt Lake City this weekend, in reality I am here with hubby getting the beehives ready for spring. Last week I mentioned we took an observation hive of live bees to a local Earth Expo. Here's what an observation hive is all about: a vented wooden box with glass sides just large enough to fit a single frame of bees inside. Hubby selected a frame containing the queen, which was an added bonus as viewers enjoyed trying to spot her. It isn't always easy to do. On the top of the box is a a spot where a mason jar of sugar syrup may be inverted, to provide food for the bees. In this case, hubby chose a frame which contained honey so the feeder was not necessary. The mesh over the hole also allows air to get in...but prevents the bees from getting out. Here we are returning the bees to their hive after the Expo. You can see a puff of smoke wafting up through the top vent. There are also mesh-covered side vents, and these were used to smoke the bees. The smoke is said to calm them, but I'd have to say it makes them stick close to their hive and queen and less apt to fly out or attack. After smoking, hubby lifts the lid of the observation hive. It is cleverly secured by strips of velcro which make for a tight seal and easy removal. What did we do before velcro! Yes, bare hands and no, he did not get stung. The frame was successfully replaced in the main hive. We expect those bees had spent the day wondering where their queen had gone. The weather has warmed a bit and there are lots of flowers around, so it was time to unwrap and remove all the winter insulation from the hives. It's a big job...worse than wrapping them for the winter as all the boxes are unwrapped, opened up, cleaned out, frames scraped and replaced, etc., etc. Fortunately, the hives are looking very healthy and have wintered well. The bees in this hive had been busy building burr comb on the bottom of a frame. We saw lots of eggs and larvae (below); good signs. 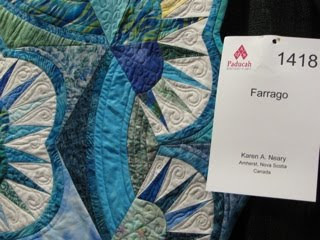 My "Farrago" quilt arrived safely back from Paducah this week. It was exciting to open the box and find more goodies inside. The organizers of the show have really made this a special experience for exhibitors. Even hubby commented on what a class act this show is. Already I have a keepsake ribbon which identifies it as a semi-finalist. Now I also have an event catalogue, the show tag, and the comment sheet from judges Donna Wilder, Katie Pasquini Masopust and Libby Lehman. Very cool. Best of all was this printed fabric label which may (will!!) be sewn to the back of the quilt. 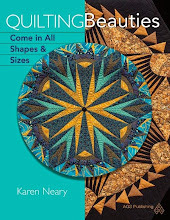 There will be a show book arriving shortly which has pictures of all the quilts in the exhibit. I have been sitting with fingers crossed that some benevolent soul attending the show would share some pictures and I was rewarded with not one but three sets of photos. How wonderful! Interesting to note that Gaile, Ruby and Lynn are all seasoned Paducah veterans, having attended other shows in past years although none had encountered flooding before. Here's Gaile: she has a good time wherever she goes! Ruby M. from Dartmouth, N.S. had the pleasure of attending the show on a coach tour with other quilters, stopping at all kinds of interesting places along the way. Ruby writes: "It was a treat to be able to see two Nova Scotia quilts in Paducah, the other was a beautiful applique, hand quilted bed quilt by Marg Ferguson from Glace Bay." I will be watching the show book to see Marg's quilt; thanks for the heads-up, Ruby. Lynn from Nebraska shared these, but has also posted several slideshows on her blog. I encourage you to take a look as the quilts are incredible. My sincere thanks to Gaile, Ruby and Lynn for graciously sharing these photos. Edit: I've just found Marg Ferguson's quilt "Cherries Jubilee" in Part 3 of Lynn's Paducah slideshow. Have a look!